It was the middle of the night and we were anchored in Delaware Bay when Capt. Esper ordered all aboard the M/V Sea Hunter to put on their life jackets and report to the pilot house. As I left my small room, arms stretched to help keep from being thrown from one wall to the other, I was not feeling brave. Just the noise alone was frightening, as the winds howled with 70 mph gusts. My room was on the second level of the ship and you had to climb a flight of stairs to reach the pilot house. I literally held onto the railing with both hands using all my strength as I slowly walked up each step. If you didn’t hold on to something you would be slammed up against the wall. I had many bruises on my shins to prove this. 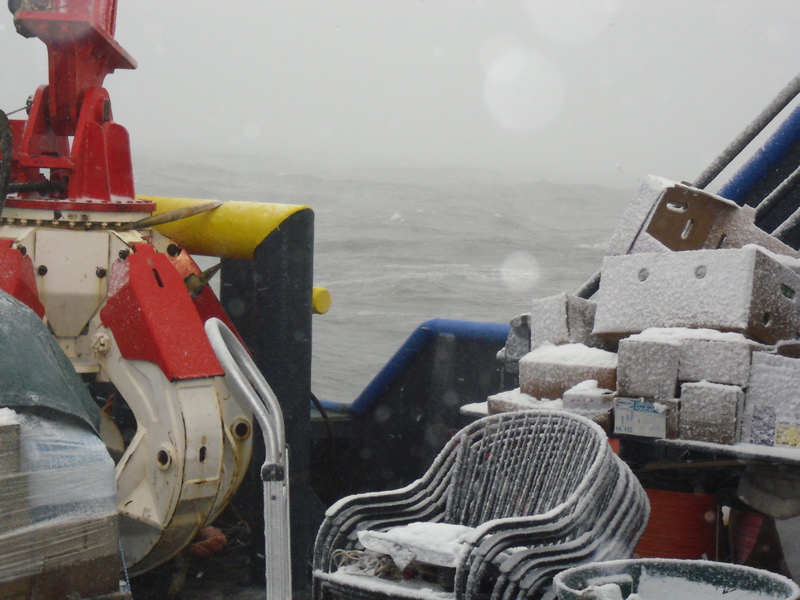 Everything on the deck of the M/V Sea Hunter was frozen. With everyone safely in the pilot house and their life jackets on, I looked around to see if I could read anything in their faces. I desperately needed to see that everything would be fine. Capt. Esper informed us he had been listening to the marine weather channel and that they had declared it a full blown nor’easter. It was being considered the worst storm of the century in Delaware and the governor had declared a state of emergency. That was the last thing I wanted to hear. He also stated that he had full confidence in the ship being able to weather this storm and that we all needed to stay together and be calm. Easy for him I thought, he had been through many storms. This was my first experience and it was beyond frightening. As each swell lifted the ship to one side, it felt like we would flip over. Brian Ryder (chief engineer) tried to reassure me it was almost impossible for that to happen. I prayed that was the truth. Everyone was trying their best to stay positive and was trading wise cracks with each crash of a wave. I suppose that helps some to cover up their fears; however it wasn’t working with me. Though we had made sure everything aboard was tightened down, we could hear crashing from below. 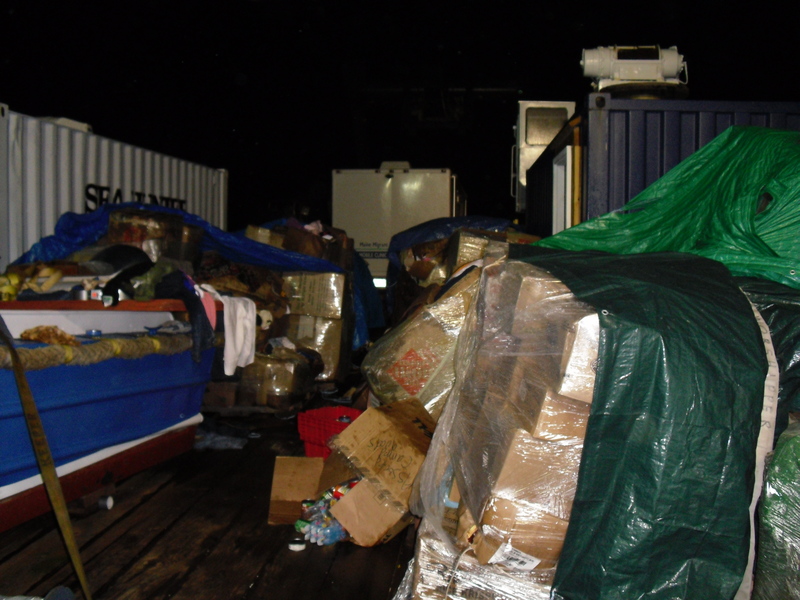 We were also all concerned with the hundreds of boxes of aid that were exposed on the deck. The thought of losing them was disheartening. I couldn’t believe that all the hard work and wonderful donations that were desperately needed might be lost so quickly. I think because it was the middle of the night and you couldn’t see anything outside, was making matters worse. I just wanted this night to be over and for us all to be fine. I kept checking on Nine (ship’s resident cat) who was lying nervously on a make shift bed in the corner of the room. We all took turns petting and talking with him throughout the night. I think as much as it soothed Nine, it also helped calm us. Julia sitting against the wall of our room with all the draws emptied and thrown about. With all of us near exhaustion, the light of morning was slowly appearing and the wind was finally lessening. We were able to move around a bit more safely, though you still had to hold onto something. As some of us headed downstairs to check the rest of the ship out, I was praying there wasn’t much damage. The first thing we noticed when we opened the door into the lounge area was it looked like a tornado hit it. We had a 32” flat screen TV screwed into the top of a wooden bookcase. It had become unscrewed and was upside down on the floor. The books and magazines that were in the bookcase were scattered about the room. When Julia and I opened the door to our room, again, it was complete chaos. 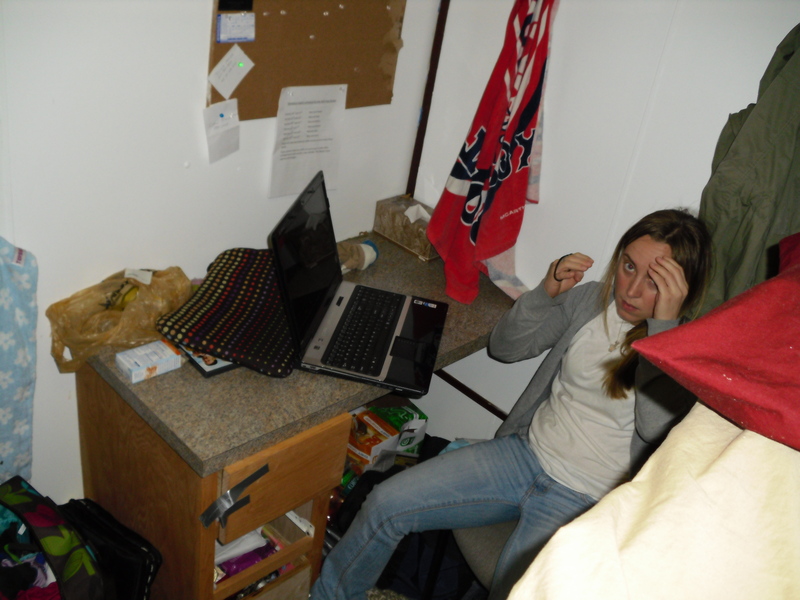 The drawers from our bunk and desk came completely out and all its contents were thrown throughout the room. We both looked at each other in disbelief. I headed to the galley hoping it fared better. Though the cupboard doors had hinges that made it difficult to open, we also duct taped them before the worst of the storm. Thankfully they were still all shut (gotta love that duct tape). The mess was minimal in the galley and walk in freezer. It didn’t take long to clean it up and get things back in order. Though we were still rocking quite heavily, I decided to make breakfast. We hadn’t eaten a meal in over a day and felt this would be what we all needed. Alex stepped outside onto the deck to check for any damage to the boxes of aid. Of course the boxes were soaking wet and some were torn open and spilled over, however it seemed we hadn’t lost much if anything. This was great news as we knew it could have been a lot worse. After breakfast we cleaned up the messes made from the storm and got the ship back in order. Since I didn’t get any sleep the night before, I decided to lie down for bit, thinking we would be pulling the anchor and heading on our way.